It may seem puzzling to suggest that a bullet as popular, proven, and successful as Hornady's XTP could possibly be considered underrated at this stage of the game, but that's exactly what it is. Long considered one of the finest self-defense and hunting pistol bullets ever designed, it is that and a whole lot more. I can't begin to guess the tens of thousands of deer that have fallen to this superior bullet over the years. But I can tell you that the .452", 300 grain XTP married to the short, black MMP sabot has accounted for over 1500 head of deer taken by Savage 10ML series rifles in one small area of Coastal Carolina alone. Henry Ball actually designed his smokeless muzzleloaders around the Hornady 300 grain XTP, and they remain his favorite muzzleloading bullet to this day due to their accuracy and, as the letters stand for, "eXtreme Terminal Performance." In muzzleloading rifles they have taken deer from distances of 3 feet to 327 yards, and have also cleanly harvested bear, elk, and moose. 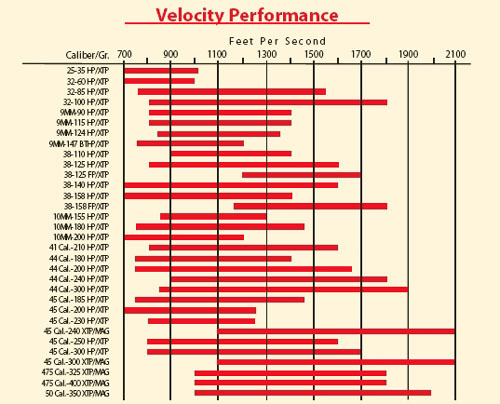 Even Hornady underrates their .452", 300 grain bullet, if you examine their performance graph shown below. Hornady 3oo grain XTP bullet graph. One could reasonably believe that the 300 grain XTP has design parameters inclusive of strike velocities ranging from 750 fps to 1700 fps. Well, I'm here to tell you that in terms on terminal velocity, field results have shown no core separation and 70% plus weight retention at past 2100 fps terminal velocity. There are several components in the XTP design that allow for this. Yes, it is a handgun bullet, but not just any handgun bullet. It is relatively long for caliber compared to other pistol bullets, and the cannelure that may steal a point or two of ballistic coefficient clearly helps inhibit core separation, even when smashing through heavy bone. The tapered jacket allows for a far tougher bullet than could be made by just using the same jacket thickness throughout, and the generous hollow point ensures good expansion down to the anemic velocity of 750 fps. There is another factor that is a clear trend in the Savage 10ML-II that accounts for its superb accuracy: the XTP has a flat base. Jacketed bullets with concave, indented, "ringed," or boat tail bases have generally given me problems in the accuracy department. No problem with the XTP in this regard. As a bonus, it is economical, at only $14 or so for 100 bullets. You cannot buy this level of performance for anywhere else at near fourteen cents per bullet. The XTP is a far superior terminal performer compared to the Hornady SST; there really is no dispute about that. It isn't my fault that Hornady's 300 grain XTP is so darn good, Hornady is responsible for that. Let's take a moment to look at the exterior ballistics of the 300 grain, .452" XTP out of the Savage 10ML-II, as powered by 45 grains of Accurate Arms 5744. You can expect a muzzle velocity in the general area of 2100 fps and a six inch kill Maximum Point Blank Range of about 190 yards. At that range, the bullet is still traveling about 1400 fps, right in the middle of its design parameters. Over 1300 fpe are injected into your game animal at 190 yards. Compare the lethality of this load with the .35 Remington factory cartridge shooting a 200 grain bullet and you might be surprised. The .35 Remington is also traveling about 1400 fps at 190 yards, but has only 873 fpe of energy left with which to harvest game. A far larger permanent wound cavity, and deeper penetration of our 300 grain 10ML-II load is the very likely result. The 300 grain XTP has the capability to cleanly drop game where the .35 Remington runs out of gas. For Triple 7 powered 1:28 rate of twist barreled inlines, the 250 grain XTP is likely a better choice than the 300 grain to keep the velocity, energy, and trajectory reasonable downrange for deer hunting. That bullet, at a MV of 2100 fps, has a 182 yard MPBR and strikes with 908 fpe @ 190 yards. In the Savage 10ML-II, though, the 300 grain XTP shines by comparison. For the dollar, it offers the most performance that can be had in a muzzleloading projectile.